Portsmouth, New Hampshire...There’s a fabulous treasure waiting to be found on the corner of Middle and State Streets in downtown Portsmouth. That beautiful yellow Georgian mansion is the John Paul Jones House Museum and Gardens and it is waiting for you to visit and discover all it has to offer. Portsmouth Historical Society announces that the John Paul Jones House Museum and Gardens, a National Historic Landmark, will open for the 2018 season on Memorial Day, Monday, May 28. Open seven days a week from 11 am-5 pm, the landmark remains open until Columbus Day, Monday, October 8, with special one-day opening on Veterans Day, Sunday, November 11, 2018, when admission is free. New this year is a special exhibition of works of art of many types by women from the Seacoast area. Titled Overlooked and Undervalued: Three Hundred Years of Women’s Art from the Seacoast,” the exhibition is organized by Gerald W.R. Ward and Lainey McCartney. Throughout history, women’s art (and contributions by women in all fields) has often been “overlooked and undervalued,” regarded as inferior to art created by men or relegated to the world of decorative household crafts. Nevertheless, working within these confines, and often coping with the demands of child-bearing and child-rearing, women have created important works of art, broadly conceived, often notable for great technical skill and inventive approaches. This exhibition examines some of the myriad forms of female artistic production, both professional and amateur, in the Portsmouth area during the last few centuries. It also serves as a companion to “Gertrude Fiske: American Master” and its related exhibitions in the galleries at Discover Portsmouth. Those shows demonstrate the challenges and achievements of women in the traditional arena of academic painting from the early twentieth century to the present. “Seacoast Masters Today,” for example, reflects the current vibrancy of the art community in the area. Some of the precursors to that modern world are represented here, but we have expanded the boundaries to include many other types of art. Thus, in addition to paintings, works on paper, and miniatures, this show also explores quilts, needlework, beadwork, clothing, painted china, and other objects created by women over three centuries for both aesthetic expression and commercial employment. The display provides a glimpse not only into the colorful “labors of love” fashioned by women of all ages for domestic purposes, but includes several works done by professional female artists competing in the marketplace and seeking to make a living through art while also teaching or engaged in other pursuits. The full story of women’s art in Portsmouth has yet to be written. This small show provides an opportunity to recognize some of the changing forms and contours of women’s art from the eighteenth century to (in one instance) 2017. We’re grateful to our many volunteers who help keep the JPJ House Museum and Gardens looking good – Liberty Mutual, Portsmouth Garden Club, and Portsmouth High School, and our Buildings and Grounds Committee. Scottish-born naval captain and colonial America's first sea warrior, John Paul Jones visited New Hampshire twice. In 1777, he took the Portsmouth-built Ranger with a Piscataqua crew to France. There he worried the British in a series of guerilla raids before his famous battle on the Bon Homme Richard. Later, as a hero decorated by the king of France, he returned to Portsmouth to fit out the America, the largest ship of war ever built in the nation to that day. While he was here, Jones stayed at the Purcell House, today known as the John Paul Jones House. A National Historic Landmark is a building, site, structure, or object that is officially recognized by the United States government for its outstanding degree of historical significance. Out of over 85,000 places that have been listed on the country's National Register of Historic Places only about 2,500 are recognized as National Historic Landmarks. There are eight sites in Portsmouth: the USSAlbacore, Richard Jackson House, John Paul Jones House, Governor John Langdon House, Warner House, Moffatt-Ladd House and Garden, Wentworth-Coolidge Mansion, and Wentworth-Gardner House. 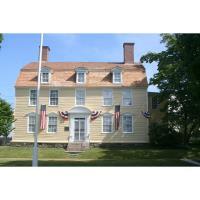 The John Paul Jones House is located at 43 Middle Street, Portsmouth, NH 03801 and is open from 11 am-5 pm. Admission is $6; $5 for Portsmouth residents, AAA, Seniors and retired Military. Members of the Portsmouth Historical Society, children under 12 and active military personnel and their families are free. Group rates available; tours are self-guided; the last tour begins at 4:30 pm.